Publishing guest posts on domains other than your own is a great way to connect with industry influencers and attract highly qualified visitors to your website. To get the most out of guest posting, you’d ideally want to publish your content to a top tier blog that already has an established audience. Where do I find blogs that will accept my guest post? The first step is finding someone who is willing to develop a guest posting partnership. Blogs related to your industry, but are not run by direct competitors, are often good candidates to approach. You can also ask your colleagues if they have any contacts who might be interested, or try to connect with potential partners via LinkedIn or at professional networking events. Google is the next step beyond your professional circle. Search for terms related to your business, to uncover blogs that have accepted guest posts in the past. To further refine your search results, try adding qualifying terms such as “guest post” and “guest author” to the end of your search query. 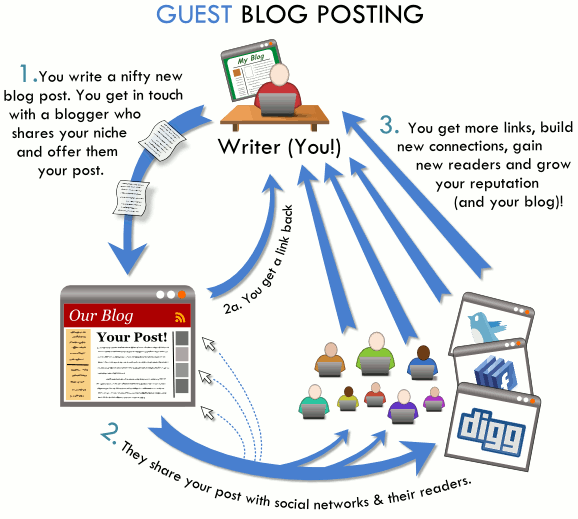 You can then approach promising blogs about a guest posting deal. Studying the blog you’ll be guest writing for will give you a good idea about the subject matter and writing style that will provide the most value to its visitors. Writing about a topic that complements a recent article can create a good “content flow” for returning visitors. Just make sure to avoid repeating topics that have already been covered, and creating content around a subject you are unfamiliar with.